What better way to celebrate National Spinach Day than to make some amazing spinach-inspired recipes! As my grandmother always said, spinach is great for your health. Of course, for 6-year-old me, this statement made no sense. Now that I am wiser and older, I can positively say spinach is great for digestion and an excellent source for vitamins. So, if you’ve become a spinach lover, like me, you’ll be making up any excuse to cook these recipes. This recipe goes great with either pita chips or potato chips! 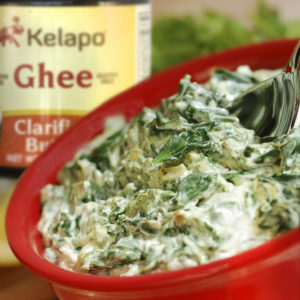 In a medium-sized saucepan, add in the melted Kelapo Ghee and turn on the stove to medium-high heat. Then you’ll want to add in the sprig of rosemary and let them fry until the leaves become crisp. With tongs or a fork, remove the sprigs and place them on a piece of paper towel. Makes sure there are no leaves left in the saucepan. Add in the onions and reduce the heat to medium. Cook for about 20 to 25 minutes while stirring occasionally. When they turn soft and have a brownish caramelized color then they are ready. Next, add in the minced garlic and stir together. Cook that for about 1 minute. Once that’s finished, add the spinach into the pan and cook until the excess moisture evaporates. You’ll want to continuously stir for about 2 minutes and then add in the cream cheese. Stir the cream cheese until it’s completely melted and blended with the onions and spinach. Once it’s melted, then remove the saucepan from the heat and add in the mayonnaise, lemon zest, salt and pepper. Stir everything together and when it is all blended then add in the lemon juice and mix. Place the dip in a big bowl with plastic wrap on top and refrigerate for 2 days. For added taste, remove the rosemary leaves from the stem, finely chop and sprinkle when the dip is ready to serve. With this recipe, I changed it and substituted the butter for ghee. This is a great meal to make for the family on a weekday because it’s fast and easy. Total time is about 30 to 35 minutes! In a large sauté pan, add in water and bring to a boil. When adding the salt to the pan it is at your discretion. Following the directions on the packaging, cook the pasta al dente. Take the ravioli’s out with a slotted spoon and place them on a single layer on the sheet pan. Throw the water away and place the pan on the stove over medium heat. Pour in the olive oil, Kelapo Ghee and garlic then sauté everything for about 1 minute. Next, add the red pepper flakes, salt, and pepper and stir everything together with a rubber spatula. Add half of the ravioli to the pan and stir until they’re completely coated, and then add the other half. Make sure to flip the ravioli to prevent them from sticking to the pan. Cook the ravioli’s until they’re golden brown and then toss the spinach. Stir everything together and then garnish with the parsley and parmesan. Last but not least, serve and enjoy! If you enjoyed these recipes or have more ideas, leave a comment below!